Posted on January 6, 2015. Book Review from Footdown. A collection of one hundred and one stories from around the world, Paul Smith’s latest book ‘Parenting with a Story’ transcends cultural difference and defies its narrowly focused title in its narrative exploration of 27 moral values. Avoiding the self-righteous disdain of a critical parent, the stories are informative and accessible individual journeys that have universal appeal; the author notes in the foreword that “we’re never too old to learn from a good story”. This book contains a number of particularly compelling stories, reaffirming the increasing awareness of the power and importance of stories as vehicles of change, both domestically and in business. The stories that Paul Smith has compiled are important individual triumphs, often in the face of adversity and always life-changing (sometimes world-changing) in their conclusion. As previously noted, a number of the values that are explored in this book are relevant to all ages, beyond the role of being a parent. Far from that old proverb about teaching old dogs new tricks, this book corroborates the growing swell of opinion that neuroplasticity, or the process of learning throughout one’s life, is both real and beneficial. Although outwardly positive, the potential value of failure in that process is recognised. The story of a failed businessman who had suffered a mental breakdown, lost several of his partners, found himself unemployed at 49 years of age and had by no means achieved success in the conventional sense of the word is just one such example in this book. This particular example refers to Abraham Lincoln who went on to be elected to the White House at 51 and eventually effected some of the most significant constitutional changes in US history before his assassination in 1865. The author notes that our pride can often lead to the misinterpretation of other’s actions and get in the way of our ambitions; no one wants to be the “Rambling Rhonda” at a dinner party, boring peers with ostentatious anecdotes. Many of the stories depict an effective ‘middle-way’ that involves, and occasionally advocates, failure – Smith does not substitute human nature and its associated faults for some grand and wildly idealistic view of success, happiness or good character. This is a refreshing approach in a literary genre saturated with the proclamation of impossibly ambitious superhuman leadership qualities. 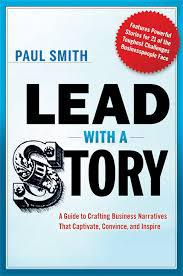 At a higher level, Smith advocates the power of a relevant narrative in the business world. In the same vein, Simon Sinek’s Ted Talk and ‘Golden Circle’ theory reminds us that it is often not what a product or business is or how it might be better than it’s competition that the end consumer is necessarily interested in or persuaded by, more the story behind why it exists. As Sinek articulates in his talk, a number of well-known businesses and leaders owe their success to having effectively established an emotional connection with the 3rd party, whether that be a consumer, supporter, campaigner or employee; persuasively answering the why. Importantly, stories “reveal meaning without committing the error of defining it” (Hannah Arendt). Stories can help establish a compelling clarity around a vision and purpose that is otherwise hard to convey. At Footdown we understand that, in business, the long-term vision of an organisation is often obscured by the multiplicity of necessary short-term milestones that are critical to survival but not necessarily an important part of its future ambitions. Stories can play an important role in the process of sorting the strategic wheat from the chaff, clarifying the organisation’s vision and strategy and helping its external appeal to the market in the sales process. Customers are often driven by emotion, looking beyond the features of a product to its benefits. Businesses often fall foul of this principle, blindly regurgitating the features of a product to uninterested and disengaged consumers, failing to establish the potential advantages and benefits of those features. 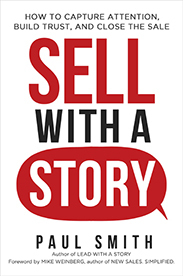 Paul Smith’s book contains stories that are proponents of some of the crucial elements in the story driven sales process – ambition, humility and a tenacious drive. Perhaps, rather like the boy who’s childhood dreams of being an astronaut drove an incredibly successful career, the adoption of the story format by a business in the sales process can yield unexpected improvements in results. At Footdown, our innovative iFootdown diagnostic can help in the process of identifying and improving clarity around the story of an organisation, examining its current state and future direction. Our flagship High Performance Workplace Workshop focuses on the Culture, Performance and Engagement of the organisation to accurately and quickly determine the most effective way to drive future performance.